KINGSTON, R.I. — June 22, 2018 — A researcher from the University of Rhode Island's Graduate School of Oceanography and five other scientists have discovered an active volcanic heat source beneath the Pine Island Glacier in Antarctica. The discovery and other findings, which are critical to understanding the stability of the West Antarctic Ice Sheet, of which the Pine Island Glacier is a part, are published in the paper, "Evidence of an active volcanic heat source beneath the Pine Island Glacier," in the latest edition of Nature Communications. Assistant Professor Brice Loose of Newport, a chemical oceanographer at GSO and the lead author, said the paper is based on research conducted during a major expedition in 2014 to Antarctica led by scientists from the United Kingdom. 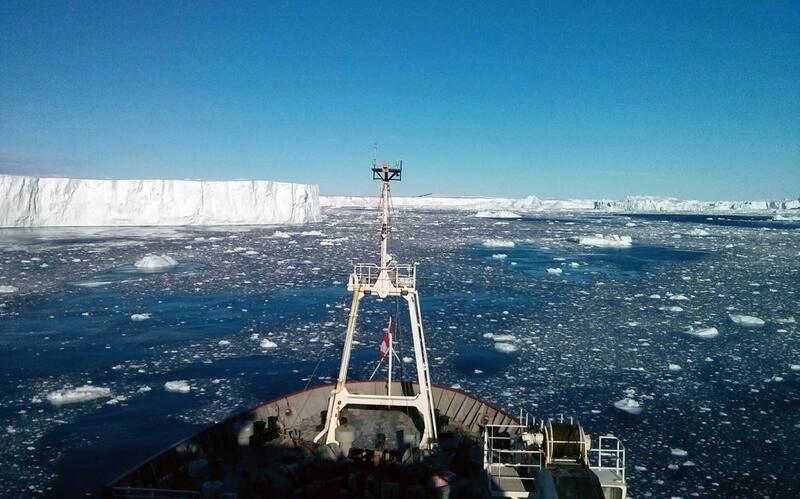 They worked aboard an icebreaker, the RRS James Clark Ross, from January to March, Antarctica's summer. "We were looking to better understand the role of the ocean in melting the ice shelf," Loose said. "I was sampling the water for five different noble gases, including helium and xenon. I use these noble gases to trace ice melt as well as heat transport. Helium-3, the gas that indicates volcanism, is one of the suite of gases that we obtain from this tracing method. "We weren't looking for volcanism, we were using these gases to trace other actions," he said. "When we first started seeing high concentrations of helium-3, we thought we had a cluster of bad or suspicious data." The West Antarctic Ice Sheet lies atop a major volcanic rift system, but there had been no evidence of current magmatic activity, the URI scientist said. The last such activity was 2,200 years ago, Loose said. And while volcanic heat can be traced to dormant volcanoes, what the scientists found at Pine Island was new. But as the team conducted its research, it found high quantities of an isotope of helium, which comes almost exclusively from mantle, Loose said. "When you find helium-3, it's like a fingerprint for volcanism. We found that it is relatively abundant in the seawater at the Pine Island shelf. "The volcanic heat sources were found beneath the fastest moving and the fastest melting glacier in Antarctica, the Pine Island Glacier," Loose said. "It is losing mass the fastest." He said the amount of ice sliding into the ocean is measured in gigatons. A gigaton equals 1 billion metric tons. However, Loose cautions, this does not imply that volcanism is the major source of mass loss from Pine Island. On the contrary, "there are several decades of research documenting the heat from ocean currents is destabilizing Pine Island Glacier, which in turn appears to be related to a change in the climatological winds around Antarctica," Loose said. Instead, this evidence of volcanism is a new factor to consider when monitoring the stability of the ice sheet. The scientists report in the paper that "helium isotope and noble gas measurements provide geochemical evidence of sub-glacial meltwater production that is subsequently transported to the cavity of the Pine Island Ice Shelf." They say that heat energy released by the volcanoes and hydrothermal vents suggests that the heat source beneath Pine Island is about 25 times greater than the bulk of heat flux from an individual dormant volcano. Professor Karen Heywood, from the University of East Anglia in Norwich, the United Kingdom, and chief scientist for the expedition, said: "The discovery of volcanoes beneath the Antarctic ice sheet means that there is an additional source of heat to melt the ice, lubricate its passage toward the sea, and add to the melting from warm ocean waters. It will be important to include this in our efforts to estimate whether the Antarctic ice sheet might become unstable and further increase sea level rise." Does that mean that global climate change is not a factor in the stability of the Pine Island Glacier? No, said Loose. "Climate change is causing the bulk of glacial melt that we observe, and this newly discovered source of heat is having an as-yet undetermined effect, because we do not know how this heat is distributed beneath the ice sheet." He said other studies have shown that melting caused by climate change is reducing the size and weight of the glacier, which reduces the pressure on the mantle, allowing greater heat from the volcanic source to escape and then warm the ocean water. "Predicting the rate of sea level rise is going to be a key role for science over the next 100 years, and we are doing that. We are monitoring and modeling these glaciers," Loose said. The scientists conclude by writing: "The magnitude and the variations in the rate of the volcanic heat supplied to the Pine Island Glacier, either by internal magma migration, or by an increase in volcanism as a consequence of ice sheet thinning, may impact the future dynamics of the Pine Island Glacier, during the contemporary period of climate-driven glacial retreat." In addition to Heywood, Loose worked with Alberto C. Naveira Garabato, of the National Oceanography Centre at the University of Southampton, United Kingdom; Peter Schlosser of Arizona State University's School of Earth and Space Exploration and the Lamont-Doherty Earth Observatory at Columbia University; William Jenkins of the Woods Hole Oceanographic Institution in Massachusetts; and David Vaughn of the British Antarctic Survey, Cambridge, United Kingdom.